A nice easy trip to Tamworth awaits the FA Trophy finalists tomorrow evening but the game itself doesn't look like being all that easy. Tamworth are on a bit of a run at the minute after re-appointing Gary Mills as their manager. 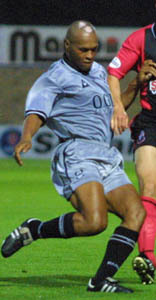 He was originally with the club back in the 2001-02 season but left to become assistant to Gary McAllister at Coventry City. He later took the reins at one of his former clubs, Notts County, and after leaving Meadow Lane he took the manager's job at Alfreton Town. When Mark Cooper was sacked in January he didn't hesitate to return as the new man in charge. Since his arrival he has turned the fortunes of the club around and lifted them from the very bottom of the pile to sixth from bottom in a matter of weeks. Just four defeats in eleven games prove that he has performed something of a miracle. It's now up to the Harriers to give them a fifth defeat and after that brilliant performance on Saturday, although we lost, it's important that we mustn't forget that we still need to try our utmost to reach the play-offs and possibly a second visit to Wembley this season. Following the game it's hard to say who ended up injured or who didn't. There were so many players going down from some bruising, unpunished, tackles. Gavin Hurren went off soon after halftime after receiving treatment so he could be missing as could Scott Bevan after he failed to recover from a calf injury picked up in the first leg of the Trophy Semi's two weeks ago. If he does get the nod over Steve Taylor then it will be the first time he has returned to Tamworth since he left them last season. We have a few former Harriers playing for Tamworth now. We all know that Adie Smith is there but to him we can add Simon Weaver, Taiwo Atieno, John McGrath and Simon Heslop. Both Tai and McGrath are banging in the goals for them and Heslop is on loan there from Barnsley until the end of the season. Simon Weaver will miss the game with a knee ligament injury and Matt Williams has now returned to training and could play some part tomorrow. As mentioned before this is going to be a bit of a tough game and I hope the lads will be up for it. If they are then I think we'll be looking at all three points but if it's a Trophy hangover scenario then I reckon we're looking at a share of the points. Bevan, S Taylor, Harkness, Kenna, Haworth, Creighton, Whitehead, M McGrath, Sedgemore, Hurren, Russell, Penn, Reynolds, Blackwood, McGhee, Smikle, Christie, Constable, White, Hay. Veiga, Smith, Touhy, Bampton, Bains, Friars, Storer, Burton, Stevenson, Williams, Quistin, Law, Imrie, Edwards, Ridgway, D Taylor, Briscoe, J McGrath, Spencer, Keen, Atieno, Heslop, Hambleton.